FOR - HUMANS In the purest sense. Not just designing to perform a functional task. To enable users to perform that task SUCCESSFULLY. FUNCTIONALITY -IS NOT - ENOUGH Providing functionality is a starting point. Yes it has to be usable. But it also has to be USED. Dusty software == failure. REWIND Let’s rewind. Perch is a small PHP and MySQL based CMS. It’s been developed as a commercial product. I’m going to be talking about my experience developing it. To share experience, not sell to you! “ With Wordpress (don’t even get me started on Drupal), the learning curve was very high, requiring my clients to learn about posts versus pages versus custom post types. ” This story is very common. Lots of capable software available, but FUNCTIONALITY IS NOT ENOUGHT. People ﬁnd their clients can’t use it. USERS Just because a lot of similar things exist, it doesn’t mean the market is too crowded. DIFFERENT This applies to Open Source projects as much as commercial products. Don’t be afraid of ﬁnding a new way to solve a problem that has already been solved. FOR SMALL WEBSITES We decided to go ahead. Focussing on a market of web designers building small sites for their clients. Portfolios, restaurants, guest houses, clubs, places of worship. LISTEN U P! CLASS IN SESSION I’ve split this up into lessons we’ve learned. ARE INEXPERIENCED When it comes to installing and deploying PHP apps - or any. Typically just HTML, CSS, FTP users. A LOT OF SUPPORT We're a service-based company. We don't have time to deal with a lot of support. SUPPORT REQUESTS We needed to ﬁnd ways to make sure that this was actually proﬁtable. That’s important for us commercially, but it’s also the sort of thing that’s important for OSS. How often does a “strong community” == “hard to use software”. SOFTWARE Developers should support their own software Then you’re exposed to the important problems. Helps to prioritise what to work on. The bugs causing users issues are more important than anything else. This used to be a very common support request. The change of wording eliminated this request almost entirely. The next step is validation on the license key format. BREAKS WELL Anticipate when the code will fail and design for it. This is important in uncontrolled environments like other people’s hosting. cult problems are wet ones. Technical problems are hard too. PHP5 AS STANDARD We chose to standardise PHP5 Thinking we’d exclude some people. We considered developing 2 parallel versions. As it turns out this was a non-issue. Any host on PHP4 these days o " ers upgrades. THE FAILED PROMISE OF SQLITE We wanted to use SQLite to make conﬁguration easier It actually makes conﬁguration harder. DB needs to be protected or outside the web root. Hard when you don’t control the hosting. <h2> <perch:content id="heading" type="text" label="Heading" required="true" title="true" /> </h2> <p class="date"> <perch:content id="date" type="date" label="Date" format="%d %B %Y" /> </p> <perch:content id="body" type="textarea" label="Body" textile="true" editor="markitup" required="true" /> We take whatever content the user gives and need to be able to store it. This would be perfect for a NOSQL database, but those aren’t common on typical hosting. SO, UM, HOW'S THAT WORKING OUT FOR YO U? It’s not ideal! The original requirement of storing schemaless data works! NON-NATIVE JSON IS SLOW We use the PEAR JSON libraries if native JSON isn’t installed. It’s really slow for the history stack. The more content, it gets exponentially slower. IS A - TWO STEP PROCESS Problem for apps. Requires some mental application logic. GOOD ABOUT IT? It solved the initial requirement. Queries are really simple - important on over-loaded shared servers. HISTORY STACK This very simply enabled us to create a history stack, and implement an UNDO feature. THEORISING IS EASY NOTHING BEATS EXPERIENCE Every solution has its pros and cons. Ultimately you have to pick one and go with it. We anticipated small sites with low content volumes so went with JSON People are building SIMPLE sites with Perch, but not always SMALL. We may have to revisit, but we can migrate architectures with a script. Yay for scripts. WE ' RE USED TO CONTROLLED PLATFORMS We're used to developing on controlled platforms and deploying to controlled platforms We specify what version of PHP. Conﬁgure INI options. Install libraries required. ALL BETS ARE OFF As soon as you give people code to run in their own environment, all bets are o "
IS - EVIL We hate WYSIWYG editors. Decided to ship with Textile, Markdown and MarkItUp! Editor. Nice compromise - toolbar so you don’t need to remember codes, but no ﬁlthy HTML. But my clients must have an editor like Wor d! People are weak. WEAK! Be strong with your clients! IT ' S NOT OUR PLACE TO TELL PEOPLE HOW TO WORK If they want to give their client a WYSIWYG editor, so be it. All we can do is give them good, sensible defaults based on our own experience. with services you can impose your will with software you can only give good defaults but have to allow people to do things you consider bad practice "opinionated software"
IS A - FALSE PROMISE People ask us why we don’t do edit in place. It makes good demo, but we don’t think it scales. CUSTOMERS ' PROBLEMS Work out what will make their lives easier, but also make them a hit with their clients. IS - EVERYTHING Getting the end client to use a CMS is a big hurdle for our customers. Clients are confused by things like Wordpress. We designed in features to help. the functionality of software doesn't make it useful on its own - combo of functionality being there ad people being conﬁdent to use it. Core di " erence between us and OS projects. They have functionality we work very hard on how it is presented to the user. REALLY GREAT DEVELOPERS SOLVE PROBLEMS It’s not just about implementing features. Even if there is a solution if people are not ﬁnding or understanding it the solution is still broken. I love the little cms but the one thing I was expecting to get is a license for multiple domain,... if you guys can help with that you will earn a big customer,.. and as of right now I already found 2 more cms just like yours at a lower price but what they take a away is in the interface design,.. (which I could careless about it) but you guys still my number 1 option but if you guys can give me a break on that little part for licensing multiple domains that will be very much appreciated,..
WILL GET IT And that’s ﬁne. In fact it’s good. The worst thing to happen is have a product so bland that no one can object to it. 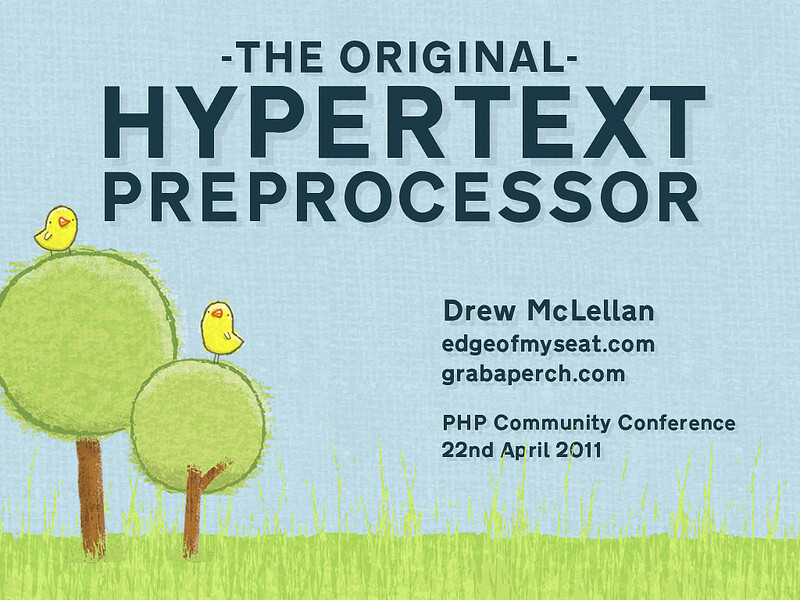 View The Original Hypertext Preprocessor on Notist. I'm loving the clean and pleasant presentation slides at @drewm's #phpcomcon presentation! Who did the artwork? "All code breaks. Great code breaks well" - @drewm at #phpcomcon. So true!